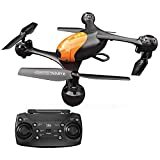 Best quadcopter drones for sale reviews 2019 – find out which quadcopter drones are best to buy. Popular brands of quadcopter drones are reviewed in this article. The quadcopter market is overflowing with quality options that are designed to provide a superb flying experience for users. The units are designed to help users achieve different objectives, including image capture, racing, recreation and more. Some of the notable quadcopters available on the market include the DJI Phantom 3 and DJI Mavic Air. DJI’s Phantoms are among the most popular drones in the world. The Phantom 3 is one of the most advanced drones in the Phantom family. It comes with a 2.7k video camera that creates 1080p videos and 12-megapixel photos. The images can be viewed in real time on smartphones. It has a 3-axis Gimbal stabilization system, including GPS. It has the capacity to remain stationary thanks to the altitude hold function. This quadcopter is fitted with LED lights that allow you to easily identify the direction in which the drone is headed. The battery has a maximum flight time of 25 minutes. The remote controller has a range of 546 yards. Buyers can also opt for more advanced and expensive versions of the DJI Phantom 3 (Pro, Advanced and 4K) that have a greater range and video resolution. Unfortunately, their prices are not affordable for everyone but they are superior in terms of build quality, range, features, flight time and ease of use. Available in several configurations, the Phantom 3 is the drone that paved the way for the Phantom 4 and Mavic Pro, which is the best drone that DJI has to offer today. The 4K drone still has interesting flight modes like follow me, points of interest, waypoint and return to home. DJI Phantom 3 Standard price – $495. The DJI brand continues to impress and consolidate its market presence. The Mavic Air surpasses the capacity of its predecessor, the DJI Spark. 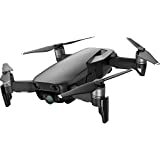 It is the ideal choice for anyone looking for a drone that is close to professional models like the Mavic Pro or the Panthom 5 Pro. In addition, this model is lighter and portable than the latter. In addition, it boasts an integrated CMOS sensor for the camera, which helps users capture quality photos and videos. The video captures are stunning thanks to the recording rate of 100 Mbit/s. Price – $699. 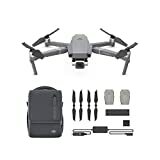 DJI worked with the Swedish camera maker Hasselblad to create the Mavic 2 Pro. This quadcopter comes with a high-quality CMOS camera sensor that works with 10-bit color. This innovation allows it to take 20-megapixel photos, capture videos in 4K Ultra HD 30fps mode and in HDR mode. The camera can follow a moving subject thanks to the ActiveTrack 2.0 technology and the obstacle detection function even when moving at maximum speed. Price – $1,878. The Karma captures images of incredible quality using an action camera attached to the drone. This quadcopter folds and fits in the included lightweight carrying case. The Karma stabilizer helps captures breathtaking videos without any image shake, whether in the air or on the ground. GoPro is best known for its action cams. These mini cameras are powerful enough to film in real 4K. Moreover, they can be mounted on almost anything. Like the DJI Mavic Pro, GoPro’s Karma is portable since its wings can fold. It is extremely easy to control for both experienced and novice users thanks to an intuitive user interface (UI). The drone comes with an app called GoPro Passenger, which lets your friends watch your bumblebee fly. 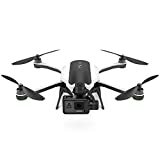 Aside from the GoPro Karma camera, this drone supports a number of different action cams like the Hero4, the Black Hero5 and more. 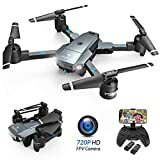 If you already have a GoPro camera, this drone is also available without a camera for a cheaper price. Retail price – $699. The Typhoon Q500 4K is equipped with a 3S 5.400 mAh battery, which gives the drone an autonomy of up to 25 minutes. The radio controller fitted on the Yuneec Typhoon Q500 4K is the ST10 +, a 10-channel radio with an Android operating system that runs on the 2.4GHz and 5.8GHz frequencies for video transmission. It has a 5.5-inch screen that allows you to view the drone video in real time. The free app allows you to view the real-time video of the camera on your smartphone. In this way, it is possible to watch the video feed even when the camera is positioned on the steady grip and not on the drone. Price – $399. 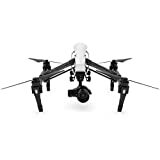 This drone comes with a 4k video camera and it is great for recording high-quality videos. Compared to the DJI Phantom 4, it has a completely different and more aggressive design than the Phantom 4. It is undoubtedly one of the best quadcopters available on the market. However, it is still a fairly expensive drone. The Inspire 1 is a ready to fly drone, which means that everything you need to control this beautiful quadcopter is included in the box. Price – $4,199. This drone is bulky and it is less portable than the DJI Mavic Pro. Putting aside this little flaw, it is a professional drone with the best camera. The DJI Phantom 4 is probably the most popular drone currently available for purchase on the market. It has the ability to take off and land automatically thanks to its excellent GPS technology. Price – $1,499. Quadcopter drones come with four propellers and engines, which differentiates them from other variants like the tricopter that has three propellers. These units are not designed for speed but stability. This characteristic makes quads ideal for aerial photography. Pitch allows you to move forward or backward by tilting forward or backward. Roll turns to the right or to the left by rotating around the roll axis traversing the quad in its flight axis. On the other hand, a hexacopter consists of six rotors, which allows the drone to climb with heavy loads compared to quadcopter drones. These units are quieter in the air mainly due to the heavier ascent weight. The increased number of propellers translates to operational reliability of the device. Should a rotor or motor ever fail (and the control electronics can recognize and compensate accordingly), a safe landing is often still possible. An octocopter is often used for heavy-lift applications as the high number of propellers can produce a much higher lift. This means an octocopter can carry heavy accessories like cameras or other payloads than quadcopter drones. A quadcopter uses four rotors or propellers to lift up and to generate propulsion by tilting the rotor plane. It can take off and land vertically. Quadrocopter drones can perform more complex maneuvers. Swarms of these devices can float in the air, fly in formations and autonomously perform complex flight stunts, such as somersaults, flying through targets and self-organization in the group. A multicopter or multirotor is more of a collective term for all copter types with more than two rotors in one plane. As such, helicopters do not belong to the multicopters category as the second tail rotor is located in a different area and thus acts in a different direction. 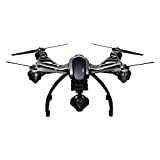 The multicopters also include the above-mentioned quadcopter drones, hexacopter and octocopter. As the name implies, four quadcopter engines and four propellers are aligned on one level. The logical consequence of this arrangement is a fairly stable flight behavior. Two opposing motors rotate counterclockwise or in a clockwise direction. The downside of the quadcopter is that there is no reliability. Should an engine fail, this inevitably leads to a crash as the remaining three engines can no longer stabilize the drone. There are usually drone kits that dictate the design. For instance, the manufacturer DJI offers in its Flame Wheel series various kits. Users can pick a Flame Wheel F330 as quadrocopter, a Flame Wheel F450 as quadrocopter or a Flame Wheel F550 as a hexacopter. Buying a drone controlled via smartphone or tablet is the simplest solution because you do not have to learn how to fly it. Performing a stunt to impress your friends is easier because you just have to press a single button to see your drone perform complex aerobatic maneuvers. The drones have many features integrated directly into the application, such as flying over a zone in 3D, recording a course and automatic tracking features. The purchase of a drone controlled via smartphone is not necessarily more expensive. 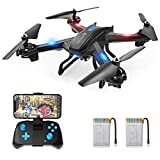 Radio controlled drones are generally more difficult to control than smartphone-driven quadcopters because they have less onboard electronics and therefore fewer grip features, such as assisted take-off or the ability to perform tricks by pressing a button. Important points to consider before buying a radio-controlled drone include the range of control. The same applies to weight and power of the batteries because this aspect has a bearing on the flight time, which ranges between 10 to 30 minutes. Some radio controlled drones have more features than others. Drones with camera controllable via a smartphone are really great to handle. Brands like DJI, Yuneec and GoPro offer some of the best quadcopters on the market. The drones vary in pricing depending on the range of features that the units offer. The price starts at around $300 and reaches upwards of $4,000. The high-end units are ideal for experienced users.